The Bankariyas, a forest-dweller community of central Nepal, have been uprooted from their traditional habitat and are living like refugees in their own country. Several other indigenous groups have suffered the same fate. The eight-year-old war between the Royal Nepal Army (rna) and Maoist rebels that has ravaged the country's environment is responsible for their plight. Several thousand people have been killed in the incessant fighting which began in February 1996. Things took a turn for the worse in 2002, when Nepal's King Gyanendra dismissed the elected government. He has installed two successive governments since then. King Gyanendra took over the reins of power after a palace massacre in 2001 that saw Nepal's then crown prince gun down a dozen people, including King Birendra, before killing himself. This was followed by one year of emergency rule. 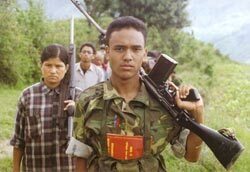 Maoist insurgents then stepped up their violent campaign to replace the monarchy with a communist republic. Today, with both sides locked in a no-holds-barred battle, the country's local communities are scurrying for cover. Driven out The Bankariyas, for instance, were heavily dependent on herbs and other non-timber forest produce (ntfp) to eke out an existence. They now toil as agriculture labourers in nearby villages, their knowledge of sustainable use of natural resources going to waste. "We have nothing, we cannot enter the forest. No forest means no work, and that means lost dignity," laments 74-year-old Jetha Bankariya. According to Rajendranath, a journalist working in the Maoist area in western Nepal: "Nobody has accurate data pertaining to the mass migration (of indigenous people). The male members of households in villages, too, have fled in fear of the insurgents. This has added to the workload of women. Farming has been hampered as well." Madhusudan Guragai, who is also a scribe, concurs and points out: "The farmers are no longer getting vegetable seeds from western Nepal. Instead, they are having to use seeds provided by foreign companies." Guragai works in Kavrepalanchok district, which is famous for its vegetable production. "Things have come to such a pass because domestic seed producers have either been captured by the government's security forces or have left the country due to the Maoist threat," he explains. Ceded territory Another fallout from the ongoing armed conflict is the blow it has dealt to the country's conservation effort. The field staff of most of the national parks and protected areas of Nepal's hills have shifted to the headquarters. In doing so, they have let Maoists, poachers and loggers have a run of the place. Bhoj Raj Bhat, an environmental journalist who recently visited the Makalu-Barun National Park in the eastern part of the country, says that there is no one to check the smuggling of medicinal herbs and other wildlife products to Tibet. "In the absence of any government representative, the local people are too afraid to question such nefarious activities," he points out. It is noteworthy that rna, which assists Nepal's department of national parks and conservation areas (dnpwc) in preserving forest tracts, has drastically reduced its presence in such belts. A dnpwc source told Down To Earth that the army's guard posts have come down from 120 to 32 in 11 national parks and wildlife reserves. While forest guards were armed with antiquated 12 bore guns earlier, they have been ordered to submit even these to the district police office. "How can they expect us to protect the forest when we are not able to protect ourselves?" says a forest guard in Rautahat, a district bordering India. "The rebels and smugglers have sophisticated weapons and we are unarmed," he adds. For their part, the insurgents have capitalised on this lowering of guard. The department of forest reveals that 19 out of 74 district forest offices, 43 out of 92 ilaka (local) forest offices, 213 out of 698 range posts, two forest training centres and two guards' stations have been destroyed by the Maoists. Yet they keep up the pretence of protecting forests. A top Maoist leader of the eastern region, Basu Shakya, has reportedly said that the rebels are not averse to the idea of pro-people conservation. "But steps such as the creation of national parks violate the people's fundamental rights. They are just ways devised by the old regime to exploit natural resources and we are against them. Conservation of biodiversity and protection of people's rights have to go hand in hand," he asserts. Shakya disclosed that the insurgents have allowed the people to kill wild animals which destroy crops. "They have to submit the skins and bones to the (Maoist) party and they can use the meat," he revealed. He, however, refused to divulge what the rebels do with the wildlife products collected by them. A study conducted jointly by the Nepal Forum of Environmental Journalists and the World Conservation Union (iucn) in three pilot districts has found that the country's natural environment is a major casualty of the fighting. The report further notes that community forest management has been hit hard. "Community members are not able to enter their own forest.... In some areas, Maoists have captured forests and impose their own rules (on) the community. They have even (slapped) taxes on... ntfp and (other forest products)," states the document. It indicates that the insurgents are collecting levy from timber smugglers in the Terai region and medicinal herb smugglers in the trans-Himalayan region. Deepak Thapa, who has authored a book on the Maoist problem, feels that the authorities have not really taken notice of the impact of insurgency on the environment. "The government has merely been highlighting the socio-economic repercussions. We need a systematic and scientific study in this regard," says Thapa, adding: "But we have to accept the fact that the environmental injustice done by the government in the past has helped the Maoists to spread rapidly in most of the hilly districts." Bhairab Risal, an expert on environmental matters, looks at the flipside of the conflict. He is of the view that since lesser people frequent forests now, the tracts are being conserved in a natural way. "We will have to wait for some years to know the results," says Risal. But a source in the Nepal's ministry of population and environment (mope) is sceptical: "The government does not want to accept defeat on every front. Therefore, it is refusing to acknowledge the fact that we are losing the battle in the field of environmental conservation." Not surprisingly, mope spokesperson Dipendra Thapa is evasive. "This is a very sensitive issue and the ministry cannot comment on it without scientific evidence. We strongly feel that there should be a study on this subject, but who will conduct it?" says Thapa. With the authorities themselves groping for answers, Nepal appears unlikely to be out of the woods in the near future.